Stratford-upon-Avon is a town in England and the birthplace of William Shakespeare. In recent years, it has become a tourist destination centered almost entirely around Shakespeare. In 1601, as William Shakespeare is preparing to debut his latest play, Hamlet, one of its cornerstone props, the Skull, is stolen by Bowser, who time traveled to the town solely to steal Shakespeare's Skull. At some later point, Mario travels back in time to Stratford in the same year to return the Skull. This involves questioning the inhabitants of Stratford about the Skull, including Anne Hathaway (Shakespeare's wife), Richard Burbage (an actor performing in Hamlet), and an unnamed, self-proclaimed "fool", as Mario does not know that the Skull belongs to Shakespeare. 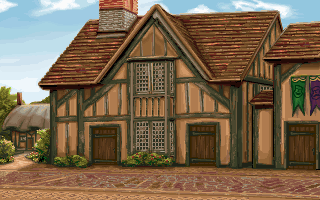 After Anne tells Mario that it is a part of the play and he absolutely confirms it, Mario visits a theater in the town, returns the Skull to Shakespeare, and promptly leaves.